Marvin Pentz Gay Jr. was born in 1939, in Washington, D.C., to church minister Marvin Gay Sr., and domestic worker Alberta Gay (née Cooper). The second eldest of six children they spent his early years in Washington before moving to the Deanwood section of northeastern D.C., as teenagers. The family were devout Pentecostal and the Reverend Marvin Gay, Sr., a strict disciplinarian, who believed in corporal punishment. Marvin Jnr was dominated by his father as a child and was frequently beaten from age seven well into his teenage years. Their relationship worsened during his teenage years, and his father often through him out of the house. Martin started singing in the church aged four, quickly becoming a soloist in the choir. Later he took up piano and drums, and music became his escape from the nightmarish realities of his home life. Marvin was encouraged to pursue a professional music career after a performance at a school play. His early muscical influences were doo-wop groups such as The Moonglows, The Five Keys and The Capris. At Cardozo High School, he joined several doo-wop vocal groups, including the Dippers and the D.C. Tones. Young Marvin dropped out of school, aged 17, to join the United States Air Force as a basic airman but was discharged shortly afterwards due to indiscipline. He formed the Marquees in 1957 with Reese Palmer and the quartet worked in the D.C. area. Bo Diddley liked them and got them a record deal, but the group's single, "Wyatt Earp" (co-written by Bo Diddley), failed to chart. Harvey Fuqua (The Moonglows) heard and hired The Marquees as employees before changing their name to Harvey and the New Moonglows. The group relocated to Chicago and recorded several sides for Chess in 1959, including the song "Mama Loocie," which was Gaye's first lead vocal recording. They also got work as session singers for established acts such as Chuck Berry, singing on the hits "Back in the U.S.A." and "Almost Grown." After the group disbanded in 1960, Marvin relocated to Detroit with Fuqua and signed with Tri-Phi Records as a session musician, playing drums on several Tri-Phi releases. Berry Gordy met Marvin Gaye at a house party and was impressed with his singing. He convinced Harvey Fuqua to sell him part of his interest in Marvin’s contract and he was signed to Motown subsidiary Tamla. There, he pursued a career performing jazz and standards with no desire to branch into R&B. 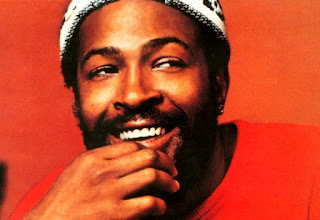 When he was teased about his surname he changed his stage name to Marvin Gaye and released his first single, "Let Your Conscience Be Your Guide", with the album The Soulful Moods of Marvin Gaye. Neither attracted much commercial attention. Marvin Gaye had a three-octave vocal range and recorded mainly in the baritone and tenor ranges in his earlier material. He changed his tone to a rasp for the gospel inspired "Stubborn Kind of Fellow" and more hits followed with "Hitch Hike", peaking at No. 30. With "Pride and Joy" (1963), Marvin used his full vocal range, starting in in his baritone range at the beginning, bringing a lighter tenor in the verses before reaching a gospel mode in the chorus. "Pride and Joy" became his first top ten single. Following this success he went on tour and his first live album, Marvin Gaye Recorded Live on Stage was recorded during a Motortown Revue show at Chicago’s Regal Theatre. A successful duet album with singer Mary Wells titled Together was released in 1964 and reached No. 42 on the pop album chart. The two-sided single, "Once Upon a Time" and 'What's the Matter With You Baby", reached the top 20. More solo international success followed with "How Sweet It Is (To Be Loved By You)", which Holland-Dozier-Holland wrote for him. Mavin had two Number One hits in 1965 with "I'll Be Doggone" and "Ain't That Peculiar". Both songs became million-sellers and he followed this up with a tribute album to Nat King Cole. Marvin and Tami Terrell had a series of hits despite her illness she continued to record under supervision. Despite their success Marvin was devastated by Terrell's sickness and became disillusioned with the record business. By 1968, Marvin was ill at ease with his success and felt he was being manipulated. He scored a massive hit with I Heard It Through the Grapevine and followed it up with "Too Busy Thinking About My Baby" and "That's the Way Love Is", in 1969. That year, his album M.P.G. became his first No. 1 R&B album. Motown artists were always encouraged not to become involved in political and social commentary for fear of alienation. Despite this Marvin recorded a cover of "Abraham, Martin & John", which became a UK hit in 1970. Although Marvin Gaye stopped short of being a radical Black Activist he did become a public figure for social change and inspired many fellow artists. Another hit duet with Kim Weston and "It Takes Two" was followed with more recordings with Tammi Terrell, mostly composed by Ashford & Simpson, including "Ain't No Mountain High Enough", "Your Precious Love". TammiTerrell died from brain cancer in 1970. Marvin Gaye took time off with depression and briefly contemplated becoming a professional football player with the Detroit Lions, before returning to his musical career at Hitsville U.S.A., where he recorded his new composition What's Going On, inspired by an idea from Renaldo "Obie" Benson of the Four Tops after he witnessed an act of police brutality at an anti-war rally in Berkeley.For the recording of "Whats going on," the singer muti-tracked his singing highlighting his full vocal range. The album followed and became his first million-selling album launching two more top ten singles, "Mercy Mercy Me (The Ecology)" and "Inner City Blues (Make Me Wanna Holler) ". In 1971, he signed a new deal with Motown worth $1 million (US$5,843,057 in 2016 dollars) making it the most lucrative deal by a black recording artist at the time. His first release was the soundtrack and subsequent score, Trouble Man, released in late 1972. Gordy was keen to distance Marvin from becoming too politically outspoken and encouraged the next album Let's Get It On (1973). This was a deeply personal project which was appreciated by his fans. The album stayed on the album charts for two years and sold over three million copies. Three hits singles including the title track, "Come Get to This", and "You Sure Love to Ball," with explicit lyrics, saw Marvin riding high once again. The next album was Diana & Marvin, and saw Diana Ross and Martin singing in tandem. He followed this up in 1974 and 1975 with a set of live performances which resulted in the release of the live album, Marvin Gaye Live! A renewed contract with Motown allowed Gaye to build his own custom-made recording studio. The release of the I Want You, solo album was delayed by Marvin’s divorce proceedings. Long and protracted he spent much of the mid '70s in the divorce court. The outcome was the singer had to make good on missed alimony payments. In early 1977, Gaye issued the live album, Live at the London Palladium, which sold over two million copies thanks to the success of its studio song, "Got to Give It Up", which became a No. 1 hit. In December 1978, Here, My Dear was released and contained songs inspired by the fallout of his first marriage to Anna Gordy. Recorded with the intention to give the royalties in in lieu of back alimony payments, the album performed poorly on the charts. He spent most of 1981 recuperating in Belgium and signed with CBS, a year later. "Sexual Healing" was the single from his first post-Motown album titled Midnight Love. It became a massive international hit. Midnight Love topped the album charts, eventually selling over six million copies worldwide. In 1983 Marvin came back to the US to fulfill a commitment to complete the Sexual Healing Tour. The pressures of the road saw the singer return to using cocaine and soon after he developed paranoia with a morbid fear of assassination. He retreated to his parents' house in Los Angeles, at the end of the tour then on April 1, 1984, after a family altercation, Marvin Gaye’s father fatally shot him with a gun he had previously been given as a gift, by his son.